You won’t need to be a detective to find clues to Monmouth’s connections with the Battle. In the case of the town’s central marketplace, Agincourt Square, they’re right under your feet. The square was given its name in the early 19th century to commemorate Monmouth’s most famous son, Henry V, who was born in 1387 in the tower above Monmouth Castle’s gatehouse. The castle belonged to Henry’s grandfather John of Gaunt and, at the time of his birth, few expected that the boy would go on to become King. While only parts of the tower and great hall are all that remains of the castle, you’ll see a statue of Henry in the square, mounted on the façade of the Shire Hall. Henry can also be spotted in the stained glass window on the south side of the town’s St Mary’s Priory Church. A memorial to those who fought in the Boer Wars between 1899 and 1902, one panel depicts the crowned King in full armour wearing an ermine-lined cape and holding the banner of England. In the background Monmouth’s iconic Monnow Bridge can be seen. Still a Monmouth landmark, it’s the last remaining example of a medieval fortified bridge with its gate tower still standing to be found anywhere in Great Britain. 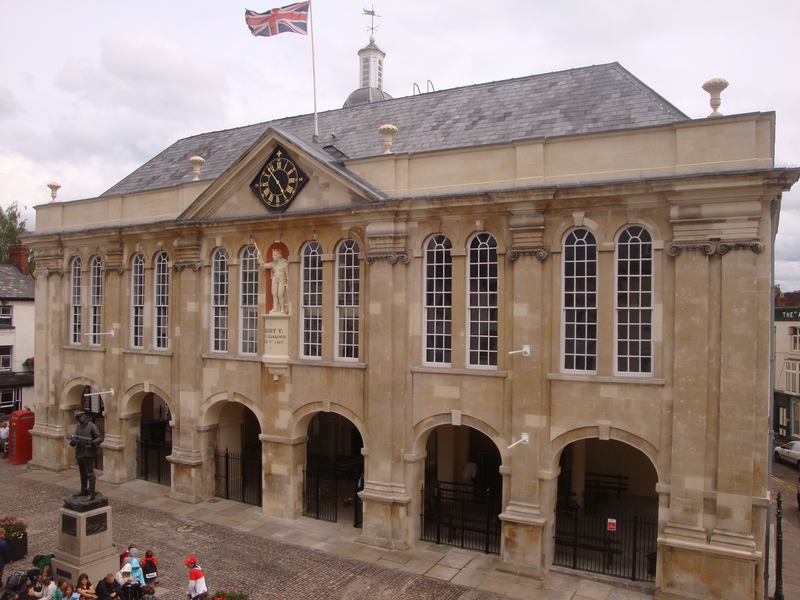 To mark the 600th anniversary of the Battle, there will be free tours of the Shire Hall with guides telling the story of Agincourt and Henry V. See our events page for more details. If you want to know more about Monmouth, head to the Visit Monmouthshire website.